Is Lebanon’s Hezbollah Equipped with New Iranian Drones? As Lebanon’s Shiite Hezbollah movement and the Israeli Defense Force (IDF) continue on what seems an inevitable path to a new round of open conflict, a report has emerged claiming Hezbollah’s armed wing has recently received a number of Iran’s most advanced unmanned aerial vehicles (UAVs), courtesy of the Iranian Revolutionary Guard Corps (IRGC) (al-Siyasah [Kuwait], November 6). The report claims that sources close to high-ranking members of Hezbollah’s military force have revealed the movement has taken possession of three types of Iranian-supplied UAVs. These include Chinese-made drones, Iranian-made Ra’d (“Thunder”) drones and, most importantly, the Iranian-made long-range Karrar drones, introduced on August 22. According to the sources, these weapons are being kept in the Bekaa Valley of east Lebanon. The Karrar (“Striker”) is a turbojet-powered drone capable of long-range reconnaissance and attack missions with a flight range of 1,000 km at low or high altitudes and a flight speed of 900 to 1,000 k/p/h, according to Iranian Defense Minister Brigadier General Ahmad Vahidi (Defense Update, August 24). The four meter-long drone can carry two 115 kilogram bombs or a guided missile of 227 kilograms and can be deployed on the back of a truck to a ground-launch position where it can be fired with the aid of a jet-fuelled take-off system. Mobility is an important consideration for Hezbollah, all of whose territory is within easy range of Israeli aerial counterstrikes. The response time of Israeli warplanes to mobile missile launches during the 2006 conflict was typically less than ten minutes, leaving little time for launch crews and equipment to clear the area. The Karrar can be retrieved by its operators through the deployment of a rear-mounted parachute. Iran opened two new production lines in February for the manufacture of Ra’d and Nazir (“Herald”) short-range, low-altitude UAVs with reduced radar-detection signatures. The Iranian Air Force also reports the development of its first stealth drone, the Sofreh Mahi (“Manta Ray”) (Press TV, February 8; Fars News Agency, February 8). Israel is preparing a multi-level missile defense system, with the new Iron Dome system expected to provide a defense against short-range rocket attacks. The Iron Dome system, however, is very complex and training its military operators has proven a larger challenge than anticipated, causing a delay in deployment. Its manufacturer, Rafael Advanced Defense Systems, has developed a cheaper and simpler version of the system called “Iron Flame.” This stripped-down surface-to-surface missile system can carry a variety of different warheads for various missions (Defense Update, November 10). The Israeli press quoted senior Israeli military sources as saying Iron Dome will now be deployed only in the case of massive rocket attacks from Gaza or south Lebanon (Jerusalem Post, November 8). The disparate cost between the complex Tamir interceptor missile used in the Iron Dome system and the cheap Qassam or Katyusha rockets it is meant to destroy is a major concern in deciding when and where to deploy Iron Dome. Should reports of Hezbollah’s new drone be accurate, the question is whether these weapons have been supplied for Hezbollah’s use in retaliation against a new Israeli offensive or whether their deployment is intended to make them available in response to an Israeli or American strike on Iran’s nuclear facilities. 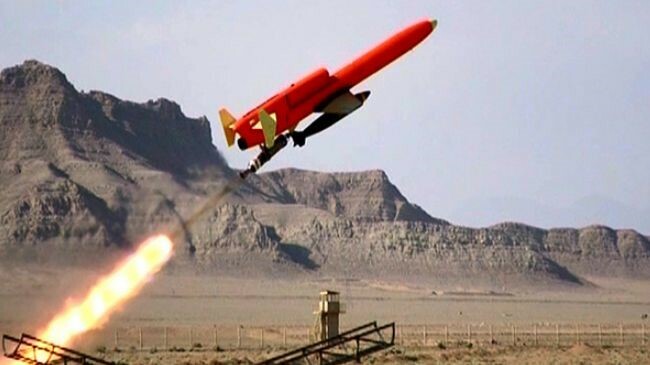 It is important to note that this latest report suggests that, as in the case of earlier Iranian supplies of advanced weaponry to Hezbollah, the new UAVs remain under the control of the IRGC trainers assigned to their management and cannot be used without the direct authorization of Supreme Leader Ayatollah Syed Ali Hoseyni Khamene’i. Al-Siyasah is a firm opponent of Iran and Lebanon’s Hezbollah. It has reported in the past that the core al-Qaeda leadership is based in Iran and that Hezbollah is stockpiling Iranian-built chemical weapons (al-Siyasah, June 7, 2010; September 3, 2009). Neither allegation has been confirmed. This entry was posted in Drones, Hezbollah, Iran by McGregor. Bookmark the permalink.